The game has one unofficial goal that all of you must perform: expanding. To build a sound economy and be able to tackle the more advanced quests and adventures, you must grow your real estate. This go through a rather resource intensive process. Expend concentric around the start zone. 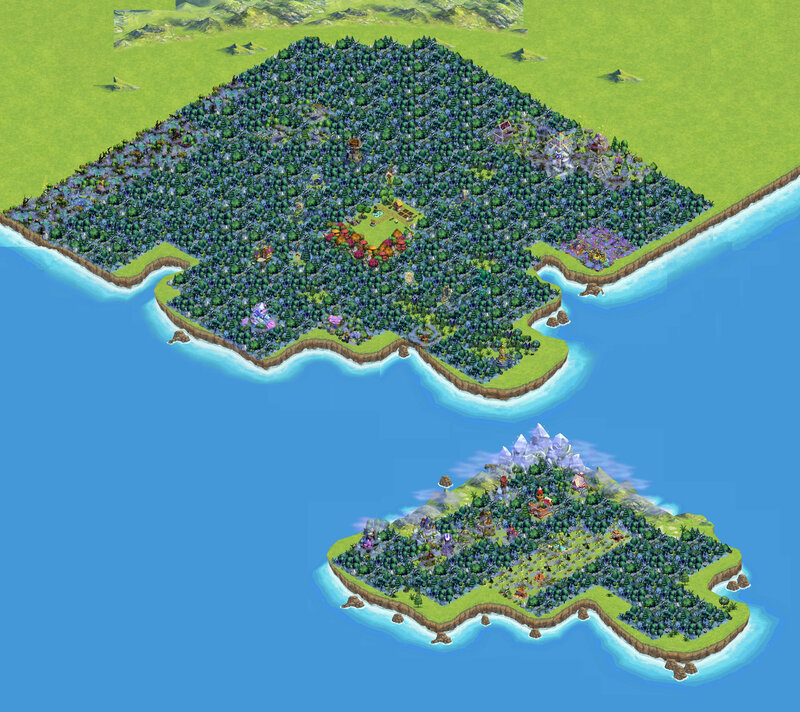 The plots closer to the center of the forest require fewer resources. Follow the main plots and expend in direction of the special features. Do them in the main storyline order! Do the expansion permit plots last, go for those with the fewer permits first. It is important to have as much as possible real estate, rather than expanding in one direction; focus on the cheapest plot you can access. 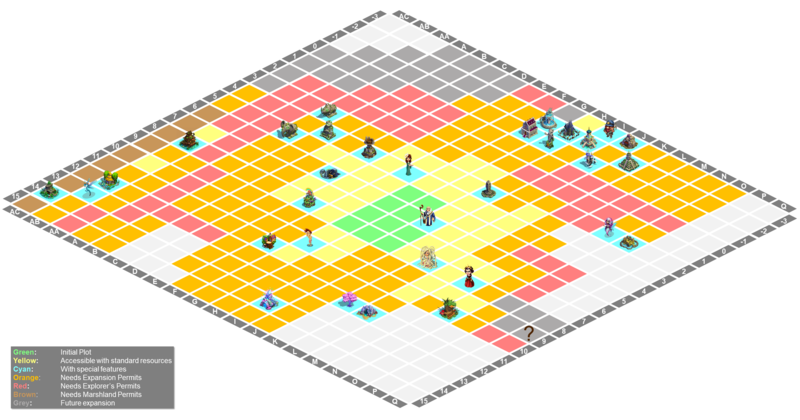 From time to time when expanding, the plot closes when all resources are given. The game makes a resynch and you cannot access the plot anymore. Just force-close the game and restarts it. The plot should be accessible again; eventually you need to adjust the RP amount. The coins, lanterns and permits are not lost. i've checked in my 50lvl nbrs lands too, it' far from expanded space, but it's there! 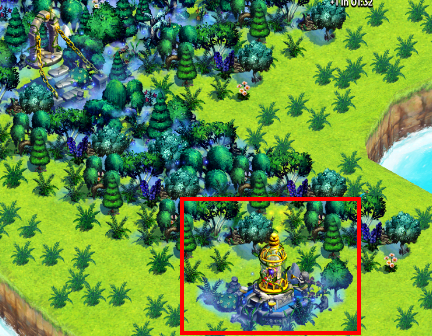 Yes in Q9 there is a shrine. It is still a closed plot. Once we reach it t will be a cyan spot. Until then it remains grayed out. Maybe you can put the dome on a grey plot? So everybody knows that something is there, but that we cant't expand to it yet. I don't have a nice graphic of it. And I was too lazy to carve it our with Photo shop. Otherwise I would have added it. 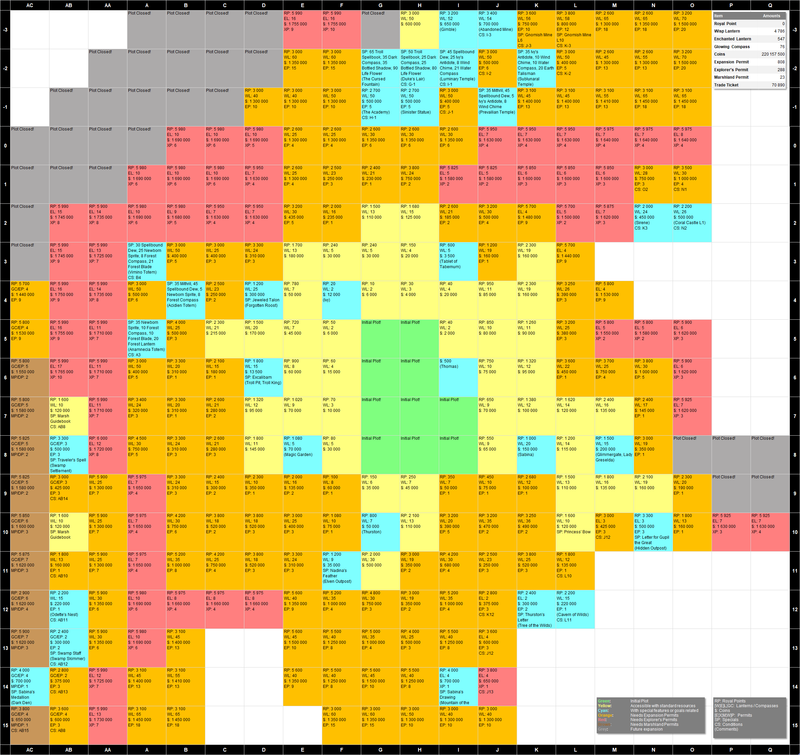 have you thought about to list off the resources you get per plot? Once I sought about it, but too bothersome. Also not sure of the added value. The general case is a bunch of trees, a rock/iron pile and some grass. I take it as granted that you get some stuff to clear after opening. And throw in the occasional mushroom and Iceland poppy plant. I purchased o8 it would not let me edit it. Any suggestions?